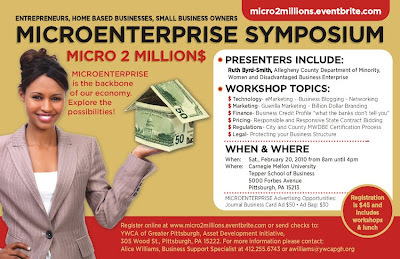 The YWCA of Greater Pittsburgh's 2nd Annual Microenterprise Symposium is the premier gathering for small businesses in the Pittsburgh tri-state area. For a second year, entrepreneurs and business professionals from this area will come together at conference to participate in in-depth workshops, educational sessions, panel discussions and networking activities. The symposium provides a way for small business owners and budding entrepreneurs to meet and explore strategies for providing support and mentoring opportunities. Connections are made by sharing experiences and real life stories about their common challenges; techniques and creative tips will be shared to help participants continue to grow their businesses. A Micro-enterprise by definition is a business with five or fewer employees, small enough to require initial capital of $35,000 or less. According to the Association for Enterprise Opportunity, one out of six U.S. private sector employees’ works for a microenterprise. This year’s symposium will take place on February 20, 2010, at the Tepper School of Business, Carnegie Mellon University. The symposium will have more than 15 concurrent sessions in which experienced professionals will make presentations and lead discussions about technology, marketing, finance, and other related topics for small business development. Join them on February 20, 2010 and look ahead to the future of growing micro enterprises to million dollar businesses.